DAS BUNKER, The Culture Wars, Saturday (NNN) — The Culture Secretary, Andy Burnham, has emphasised the necessity of new standards of decency need to be applied to the World Wide Web. Mr Burnham also plans to give BBC licence fee money to Channel Four, and also give the record industry a massive free copyright extension, three-strikes network cutoff laws and a pony. Haha, good stuff. I have a blog post planned for exactly this news story. Quick did you know: My dad has met Mr. Burnham on more than one occasion and can confirm he wears mascara. The man is a make-up wearing freak. Sad but true. 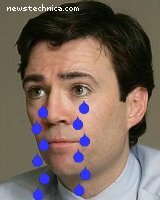 I have it on very sound authority that the said Mr Burnham is an Everton football fan. He speaks fondly of his love for the club he has supported, single-handedly, since 1878. In fact, it is common knowledge in these parts, that he prefers Everton, with Dixie Dean and Jack Sharples his heroes, to that other club in the City, Everton Ladies because he feels free to express his true feelings. He has been known to cry out “get it in” and “what was that?” several times before matches in the players lounge. His adeptness with language masks his huge desire to play for the club one day. David Moyes has been heard to say Burnham stands a chance of a game only if he stops wearing make-up. Although those of us with a true eye for talent would pitch Burnham in for ten rounds with James Purnell, that other beast of the photo opportunity.